This walk has it all; it’s remote and peaceful, there’s a mix of terrain and when you reach the chapel at the top, you’ll be blown away by soaring and incredibly beautiful views. Plus, Camino has a fascinating and sobering history as it is located on the Gustav line where the Allied forces fought the Germans in the Second World War. I first did this walk on a warm summer’s day in August 2016 and not only discovered a glorious trail, but was treated to a chance encounter with a family that gave us a rare glimpse into real life on these hills. You can read all about our day here. Rocca d’Evandro is a classic mediaeval village that sits on a small hill at the foot of Monte Camino and dates back to a Roman settlement (744). Perched on a rock, the castle dominates the village and overlooks the wide valley of the Garigliano river; a land rich in history and beautiful scenery. The centro storico is well worth a wander, as is the castle (but call ahead using the commune links below). In the 14th century Rocca was acquired by the Abbey of Monte Cassino and 1534 it was conquered by the Kingdom of Naples. But recent history is all about the Second World War. The village was awarded a silver medal of merit after the war which recognised its importance on the Gustav Line; “at the center of the opposing sides, suffering violent raids by German troops and devastating allied bombing”. This killed and injured a large number of citizens and almost totally destroyed the town, forcing; “displacement and abandonment of all personal property”. The people sought refuge in the surrounding hills and suffered great hardship. 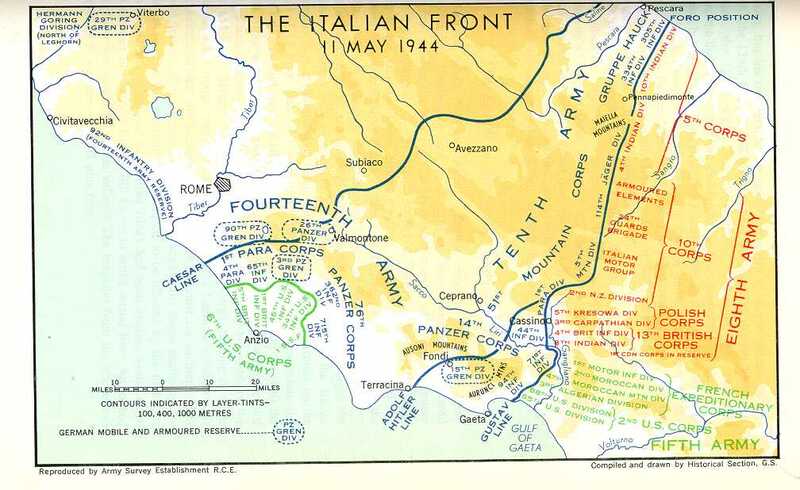 This map shows how the troops were distributed. Monte Camino is located just back from the ‘G’ of the word Garigliano (river) on the map and you can see Cassino just a little further North. From the E/45 (A1) motorway take the the San Vittorio exit on the SS430 towards Bivio Mortola. As the main road heads round a gentle right hand bend, peel off up the high street and take signs for Rocca d’Evandro. Stay on this road (Strada Provincial 110) and wind up around the outside of Rocca d’Evandro. You will pass the castle on your right – keep going up a steep hill with hairpin bends until the road brings you to Colle. You’ll see a picnic table on your left, go round a sharp left hand bend and into the village square. There is parking on the left under trees and a white war memorial on the right. Stand facing the war memorial and turn left, walking up out of the square and straight ahead into a narrow alleyway. Follow this street around a sharp right hand bend and uphill. After about 50 – 100 meters, look for a sharp right turn up another alleyway. (If you miss this, you reach a little road and will see a couple of trees and a view point on your left with some cars parked. Turn around and walk back a short way, looking for the alleyway now on the left). Go up past some fairly basic housing – it is a bit narrow and scrubby here and starts to get steeper. Soon the concrete path finishes and you’ll be on a rocky track with pine forest on your left. There is also a big rocky wall on your left. Go up here passing a little rustic wooden gate on your right. Follow this track and don’t deviate – the vegetation will change subtly as you get higher. You will eventually reach a point where the track splits. Go left uphill slightly where you will see a wooden / wire gate blocking the path. Look to your left where there will be a higher path coming in above you. Scramble up the bank and onto this path, avoiding the gate and then following the track up hill (so basically find a way around the block to continue straight on!). The path continues and gets steeper. It is then blocked again with another makeshift branch/wire gate. You will need to spend a few moments moving this very carefully and squeezing round (it’s perfectly fine – just there for when the farmers move animals and may not be there all year). Here the track reaches Camino, a tiny hamlet with a few little houses. Go past an old stone wash tub on your left and straight on up to the road. Turn right and walk up and round a sharp left hand bend. Go straight on, under some electricity wires until you reach a fork in the road. Go right past an old almost derelict farm on the right. Continue up the road until it bends left around a house on the left (sort of above you) and start looking for a small track that bends back on you on the right hand side. It’s easy to miss (there is the remains of a wooden sign to Monte Camino). If you miss this, you’ll go up the road a short way and see another wider, more obvious track in front of you. Here you have a choice. If you prefer an easy walk up to the chapel on a vehicle track, then take this route – stay on the track and you’ll reach the chapel and return back to the road at Camino in the same way. If you prefer a mountain route through the pine forest and out onto some narrower more exposed (but safe) paths, then take the first little trail I mention with the broken wooden sign). As soon as you have turned right onto this, start looking for a tiny left that goes steeply up hill (again with a broken wooden sign). It goes takes you over some rocky ground and winds through thick forest before gradually coming out into more open pine forest. Again, you will come to another makeshift gate across the path. Gently ease through, close it and keep following the trail. It zig zags up through the pines. At one point you’ll see a rocky outcrop on your right and you can step out onto this for some spectacular views. After this, it would be a good idea to keep dogs and children close. It’s not dangerous but it is a little steep and the path is less obvious. From the rocky outcrop go on up the hill and start to zig zag back and forth across the contour/ face of the hill. Even if you can’t see the path clearly, try to keep going back and forth across the hill (not straight up) and keep looking up to spot the chapel. When you’re out of the trees completely on a grassy/rocky slope (which feels a little exposed) the chapel is actually up to your right (I kept heading for the nose of the hill on the left but it’s back the other way!). Soon you’ll see the chapel high above you and just keep zig zagging up to the top. When you are there you can ring the bell to tell the world! Make sure you walk all around the building and also scramble right up to the high point at the top beyond the chapel – there are even better views and some more remains. You can walk a little along this high ridge and look at the views North towards Rome and also see the Abbey of Monte Cassino in the distance. All year. This walk is all about the views so choose a day with clear skies and low wind.